Everything we love about Shiraz. Soft, fruit driven, not overpowered by high alcohol or harsh tannins. Plum, black current on the nose - very pretty, floral - almost violet - characters. Rich and mouth filling, lovely warmth with a beautiful medium-long finish. Brightness on the top palette. Absolutely delicious. 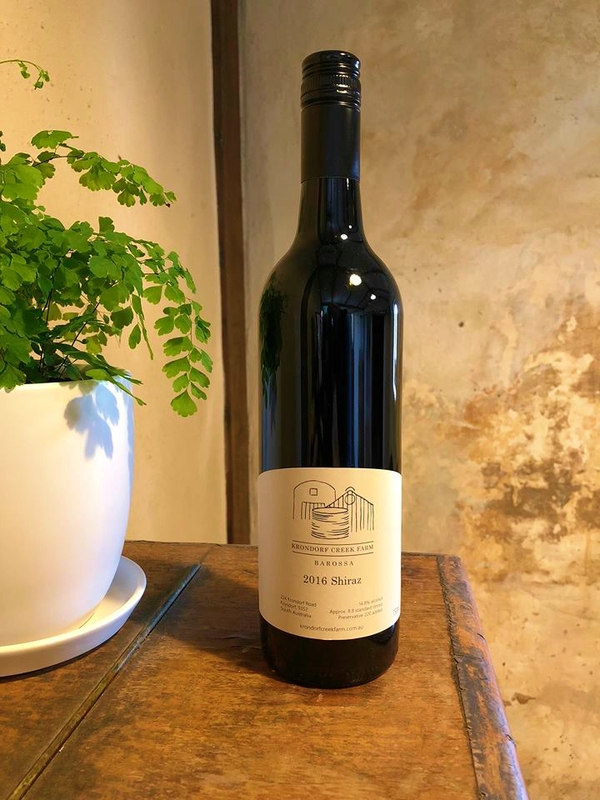 We are very proud to offer this wine as a beautiful example of the style of Shiraz James and I both enjoy so much - soft and silky, generous and quite delicious. Krondorf Creek Farm is a true estate, meaning we only produce wine from grapes we have grown ourselves, here on our property in the foothills of the Barossa Ranges. James planted our 13 acre vineyard by had 17 years ago and we continue to manage it entirely ourselves, producing wines that are soft and generous, and where the fruit characters are proudly at the fore, telling their story of this place.